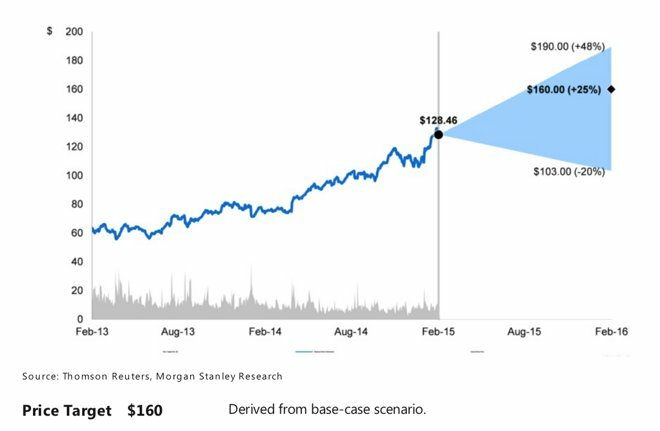 In her latest research note, analyst Katy Huberty raised her price target from a previous projection of $133. And she's also introduced a new "bull case" scenario, in which she could see shares of Apple reaching $190 if the company outperforms her own expectations. Huberty's positive outlook on Apple stems from her belief that the company's users are the most loyal of any platform. In addition, Apple users are willing to pay a premium for the superior experience that the company's platform offers. In her view, Apple is chiefly a "platform company," offering the best devices at what it considers to be a fair price. She noted that 89 percent of iPhone users plan to buy another iPhone, which means new converts to the iOS platform are likely to stick and buy new hardware in the future. Katy Huberty believes Apple will expand to new markets in the coming years, further growing its business and driving its stock price higher. In addition, this "halo effect" will encourage users to buy other Apple devices, products and services, such as Macs, apps and media. Huberty believes that with its current product lineup, Apple addresses about 33 percent of the needs in a user's day. But if the company continues to expand its presence in cars, TVs and health, there are "significant opportunities" for Apple to expand its business, she said. While rumored products like a car or full-fledged television set are "further out," in Huberty's view, she believes that near-term products like the Apple Watch will continue to expand Apple's total addressable market. She's also bullish on the prospects of Apple Pay and streaming music. Huberty's $160 price target assumes a 15-times price to earnings of $8.86 in calendar year 2015. That would be in line with large-cap technology platforms including Microsoft, Google, Facebook and Oracle. As for her "bull case" price of $190, that would be a 19x multiplier, which she said is in line with large-cap platform companies across industries. She also noted that Apple's margins, earnings growth and yield are on par to better than platform peers.